Convenient, tasty, health focused snacks & drinks 24/7. Enhance the healthy image of your venue. Enjoy a hassle free, fee-free professional vending service. Qualifying sites will earn commission. a health focused vending service. Healthy vending machine services – convenient, tasty, health focused snacks & drinks 24/7. Are you looking to enhance the healthy image of your venue and improve the availability of healthy snacks and drinks? Have you considered healthy vending? 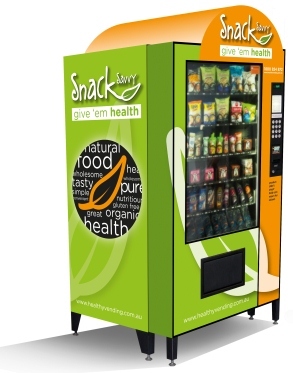 Snack Savvy is a health focused snack and drink vending operation providing workplaces, recreation centres, hospitals, universities and more with health focused vending machine services. We specialise in providing convenient, tasty, health focused snacks and drinks 24/7. So get Snack Savvy and promote a fun, healthy environment. Get Snack Savvy at your venue. It’s easy and it’s free! Well done on the healthy snacks vending machine ! Hats off to you ! YAY !!! And thank you for being a good role model on healthy eating ! With a range of over 100 items, Snack Savvy vending machines bring you many well known brands as well as gluten free and organic options.